She was inspired to write Vampire Kisses because of 4 things: a rebellious girl character came to mine, three goth girls standing on swings in a park, vampires, and Johnny Depp. She wondered....what would Johnny Depp do if he was a vampire? She wrote Vampire Kisses in 1998. She submitted her manuscript to an editor who was accepting "unsolicited manuscripts" -without an agent. Years later, her editor asked her to think about writing something new. She knew she wanted to stay with a paranormal theme. She began to think about werewolf's. Ellen was so nice to sign some bookmarks for me to giveaway. She even said she would make a donation to the Austin Children's Shelter! I am going to change the way you can enter a little bit. There will be one winner from the Literary Lonestar Facebook page, 1 winner from Twitter, and 1 winner from the blog. You can enter all three to increase your chances. 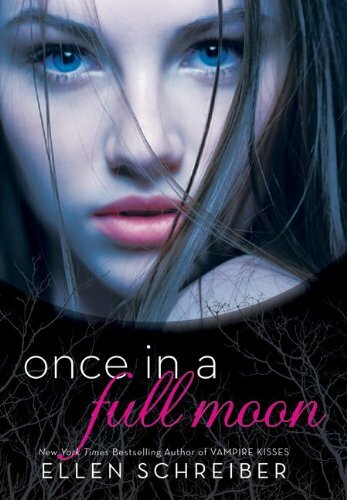 Twitter winner - Tweet "Win a signed #OnceinaFullMoon bookmark from I Read Banned Books! http://tiny.cc/v0yfp @jenbigheart @ellenschreiber @PitchDarkBooks"